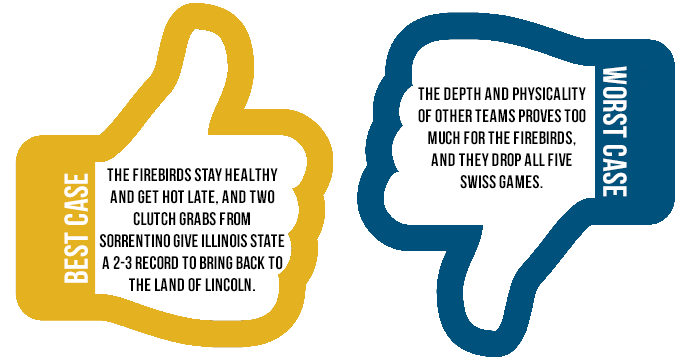 After the announcement of Marquette University dropping from World Cup 8, the Illinois State University Firebirds were quick to pick up the deferred bid and will be heading back to World Cup. On short notice, the Firebirds were able to fundraise effectively and are ecstatic about the opportunity to represent the Midwest in Rock Hill. That being said, things will not be easy for Illinois State, as it is a small team in both the size of its players and the size of its roster. The Firebirds are not physical by any means, and their lack of a full roster could come back to bite them in the Swiss system. However, even with a small roster at most tournaments, this team has been able to handle less-talented teams while giving stronger teams good games, even coming away with a statement win against University of Minnesota at Spring Breakout. This team is not one filled with star power, but it has plenty of quality pieces that help it succeed. The Firebirds are led both on and off the pitch by co-captains Alyssa Marassa and Jeffrey Siwek. 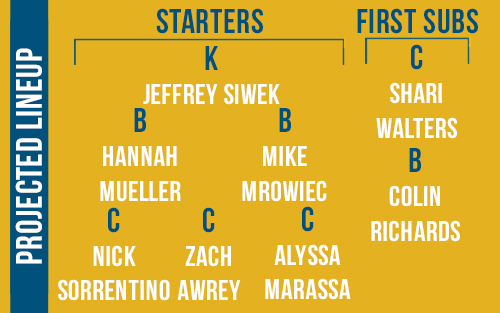 Siwek acts as the team’s primary ball carrier and distributor at keeper, and Marassa is known in the Midwest as a capable finisher by the hoops. However, for the Firebirds to roll in Rock Hill, their biggest contributions will have to come from other players. Chaser/seeker Nick Sorrentino, while not a physical presence on defense, is an adept ball handler with a decent mid-range game who will need to put up points both with the quaffle and the snitch tail, as he has walked away with every pull in official games for the Firebirds this year, including the win over Minnesota. With Mike Johnsen unable to make the trip to World Cup, Michael “New Mike” Mrowiec will have to step up in the beater game on the defensive side to ensure games do not get too out of hand. As a smaller team, Illinois State cannot rely on sheer size or athleticism to power through opponents. Its beaters are not gifted with cannons for arms and its quaffle carriers are not able to run through a defense and dunk at will. While this seems to be an opportune time for the “it’s not the size of the dog in the fight” cliché to talk about the heart this team has, it is another organ that will be vital for the Firebirds’ success at World Cup: their brain. In other sports, it is easy to differentiate between a disciplined team and a team that relies purely on its talent. For example, in football, a team relying strictly on talent will have its quarterback avoid pressure by using their quickness repeatedly against the blitz, while the disciplined team will recognize the blitz early and be able to adjust, allowing the play to develop. While it is a bit harder to differentiate in quidditch, as pure athleticism still makes up for a large part of quaffle play, Illinois State is a fantastic example of what discipline can accomplish. While only one of the Firebirds games is publicly available, from watching both film and live games it is easy to see the dedication this team has to the sport. Little things that often go unnoticed are the key aspects that can decide games, and Illinois State should pride itself on doing those little things repeatedly. Catching with two hands, defending against an offensive beater without the ball, tactical resets of the quaffle–these are all things that you see throughout Illinois State’s roster. Even without the offensive and defensive firepower that more talented teams have, Illinois State shows an understanding of the fundamentals on a higher level than most mid-level teams, which gives it a greater chance than other teams going into games. 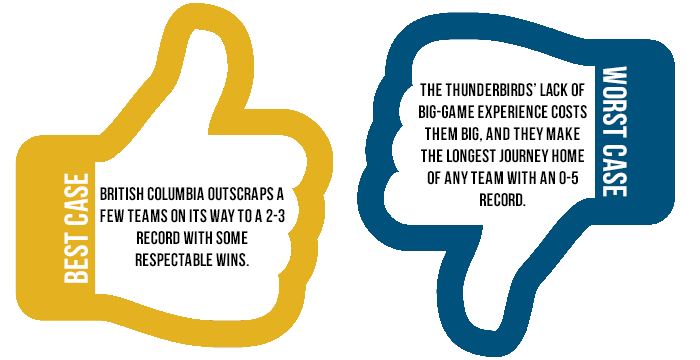 The University of British Columbia has a strong team identity, and several key players make up a big part of the Thunderbirds’ high-energy, aggressive system. However, when the stakes are high, the quaffle spends the majority of its time in the hands of one player, British Columbia’s x-factor: keeper Cameron Cutler. Cutler plays the role of hero-baller for British Columbia, and although he does not look the part, he plays it very effectively. He is relatively short and skinny for a keeper, but uses great speed to drive effectively. He has good vision and an arm for passes, but finishes best on his own with good ball skills and moves that help him beat defenders for goals. Cutler has three years of experience with the Thunderbirds, but has really emerged this year since British Columbia now plays in a region in which it contends to win every tournament it attends. Lendl Magsipoc has always been the main attention-grabber on British Columbia because of his physical play, and he is still a very effective player on his own. Magsipoc is a hugely valuable strong finisher and aggressive defender for the team. This year, however, it will be Cutler’s play that determines the fate of British Columbia. The hero-baller is an antiquated role in quidditch, but it works for British Columbia because of Cutler’s skills. The only question will be whether he is able to make the passes and drives he is used to against the much stronger and more experienced teams the Thunderbirds will face at World Cup. Before the Northwest Regional Championship, it was overgeneralized that Boise State University vs. Western Washington University vs. British Columbia was a matter of passing vs. beaters vs. physicality. The tournament proved that this is no longer the case for these teams. Boise State now holds the advantage in all three of those categories, whereas British Columbia’s aggression stands out more than anything else. Chaser Magsipoc and beater Brandon Rivas led the team to a physical reputation in past seasons, but the rest of the Thunderbirds do not pack the same punch. The beaters are quick and aggressive in their movements, pestering the other team by running all over the field. British Columbia is not an easy team to maintain bludger control against. The chaser game has become more speed-based, with passes around the hoops until the Thunderbirds find the right opportunity rather than making dunks through defenders. The Thunderbirds’ lack of physicality cost this team in its regional semifinal against Boise State. British Columbia missed a lot of chances when it got the quaffle within a few yards of the hoops, and the Abraxans are not a physically dominant team on the national scale. In order to be successful at World Cup, British Columbia will need to find a way to make its aggression more physically intimidating. If Magsipoc stays healthy (he missed the regional semifinal due to a leg injury), then he brings the most muscle to the team–a dynamic that the Thunderbirds desperately need. Combine that with the quick driving and short passing game led by Cutler, along with the all-out blitz brought on by this team’s beaters, and British Columbia can cook up some wins. Ashley Calhoun, arguably the best female beater in quidditch history, is known for her ability to transform an entire team. She was the backbone of Central Michigan University’s second semester dominance in the Midwest last year, helping her team rise to prominence in the generally rusty and snowbound region. Now, with a mishmash of talent and fresh faces, Blue Mountain Quidditch Club’s best hope for success is to build around Calhoun. Luckily for this Ohio-based community team, Chris “Barnyard” Barnard provides the size necessary to do just that in the quaffle game. As a rookie this fall, Barnard’s massive size allowed him to play with the highest level of Midwest competition based on his physicality and athleticism alone. With Calhoun clearing driving lanes, it was simple for him to run straight at the hoops. Now, having had more time to develop his knowledge of the game at the Midwest Regional Championship and Midwest Winter Fantasy, his field awareness has improved tremendously, leading to more assists than goals, as he dumps the quaffle to an outside chaser when the defense is forced to collapse on him. With an otherwise generally underpowered chasing corps, Barnard is an excellent complement to veteran John Gaffigan. If Blue Mountain is able to play a smart, transitional offense with Calhoun, alongside beater Ryan Sparks, to help facilitate the team’s consistently strong chaser defense, it will be hard to take this squad out of range. Blue Mountain has spent its season slowly yet steadily improving, finally cracking The Eighth Man’s Top 20 poll in February. 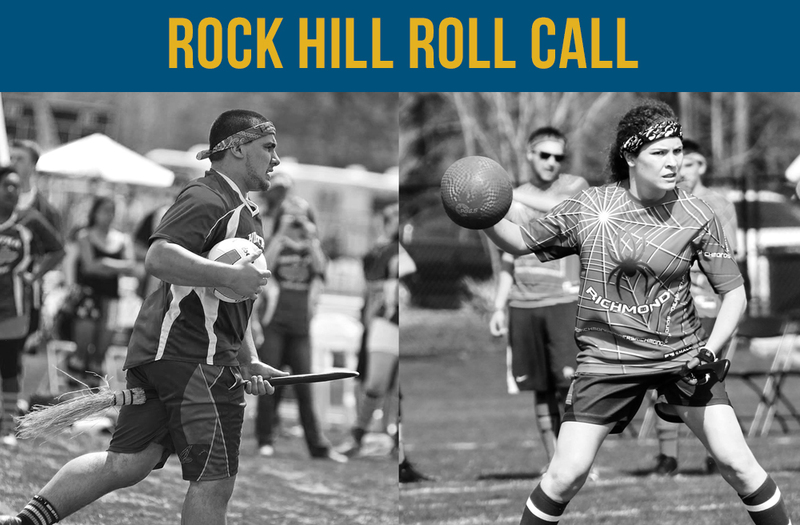 The Midwest’s premiere community team has had, by all accounts, a successful first season that it hopes will continue in Rock Hill. Blue Mountain is defined by its starting line–as long as all its major pieces are in place, this team can compete with any team in the country. The most notable name is Team USA’s Calhoun, who has had the kind of season that cements her status as the best in the Midwest. Calhoun has been covered again and again–the cannon arm, intense physicality and high game IQ combine to create an imposing beater at all levels. Calhoun spends most of her time playing with Luke Changet, and the pair rarely loses bludger control in a defensive system that places them close to their own hoops. Changet is a decent beater at best these days, but still better than more than half the players he will go up against. The quaffle game is almost entirely run by two players: keeper Gaffigan and rookie sensation Barnard. Gaffigan came to Blue Mountain after a strong career with the New York University and the NYDC Capitalists, and brings great field awareness and shot blocking on the defensive half of the field. Offensively, Gaffigan runs the offense with one of the most powerful and accurate arms in the game, using it to either snipe long goals or find teammates near the hoops. Barnard brings some talents that are slightly more tangible: 6-foot-4 and about 270 pounds of corn-fed, Midwest fury. What Barnard does is not difficult to understand, but it is rare in any sport to find a player this big who is a legitimate athlete, not just a big body. Several of the big hits and tackles this season involve Barnard, and he has come out the winner in all of them. If Blue Mountain wants to make it to bracket play, then it will rely on Barnard’s massive shoulders. As long as Blue Mountain has these starting parts, it can hang with any team in the country. The problem arises when these four players get tired and sub out or are otherwise unavailable. Blue Mountain does not have any other dependable scoring options behind Barnard and Gaffigan. 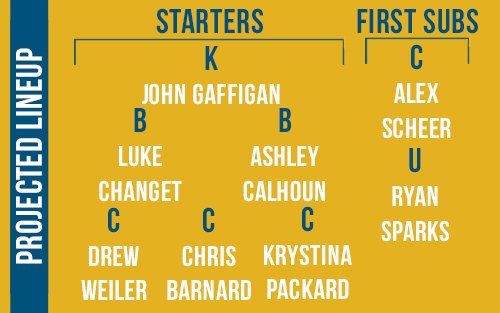 The depth at beater is better, but still not dependable against a Top 20 squad. In a weekend where a team plays seven matches to reach the Elite Eight, it is questionable whether or not Blue Mountain has the depth to get that done, even though its top-line talent definitely could trade punches with most of those teams. Most people would not expect much from a team that had a grand total of one win before its regional. After failing to secure a bid during pool play, Clone Star Quidditch Club lost to Sam Houston State University in the play-in round of the bracket and had to fight its way to earn the only World Cup spot in the consolation bracket. Although Clone Star is currently only ranked at No. 98 by USQ’s standings, it is perhaps the single most dangerous team in the bottom 20 to attend World Cup. Filled with veteran athletes, Clone Star has benefited in particular from the experience of chaser Hank Dugie. Formerly a member of Lone Star Quidditch Club, Dugie volunteered to drop down to Lone Star’s second team in order to develop the talent there, and his skill cannot be understated. A tenacious point defender, Dugie can single-handedly stop even the most skilled driver. This ability is key when facing other teams in the bottom half of the World Cup pool, as many of these teams are led by a sole skilled driver. Perhaps the scariest part of this team’s offense is that Dugie is not even the main scoring threat. Keeper Jonah Wagoner is elusive, difficult to tackle and can hit accurate mid-range shots. Chasers Damilare Ganiyu and Phillip O’Brien add speed to the lineup and can frequently break free of a defender. 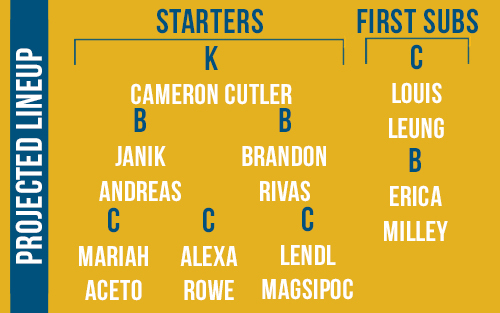 Perhaps the most surprising aspect of this team is the fact that, despite the caliber of this squad’s star-studded chaser lineup, its beating core is equally impressive. Clone Star will frequently start Dugie at beater alongside Eric Bilanoski, but only long enough to secure bludger control–Dugie subs out quickly in favor of Vanessa Sliva. The Bilanoski-Sliva partnership is truly impressive, with both beaters usually playing 10- or 15-minute stretches before subbing out. Bilanoski and Sliva’s endurance is the bedrock upon which Clone Star maintains bludger control, which in turn allows the team’s extremely capable chasers to wreak havoc on their opponents. Weaken this foundation, and Clone Star’s strategy falls apart. 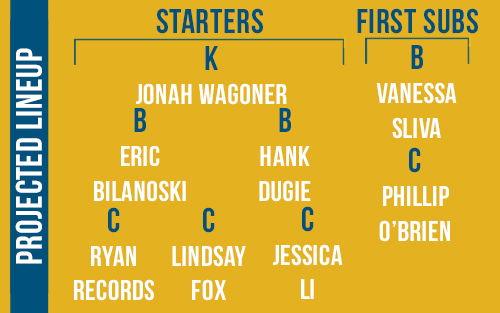 With a solid foundation of players in each position, Clone Star has been able to adapt its smaller roster to fit variable situations on the pitch. Its highly flexible, highly fluid roster allows Clone Star to truly maximize its potential–even with a diminished roster. While many may argue that Clone Star had an unbelievably poor showing during the fall and that its regional performance was a fluke, these naysayers are simply wrong. The difference between the Clone Star we saw at Diamond Cup in October and the Clone Star we saw at the Southwest Regional Championship in February is night and day. Under the leadership of captain Dilan Freeman, what once was a disorganized blob of athleticism is now a strategically-physical team. Clone Star’s dual threat of the coordination of its beaters and the physicality of its chasers has built this squad into a formidable opponent despite offensive struggles against tight defenses. Perhaps this can best be demonstrated using two games from the Southwest Regional Championship: Clone Star’s games against University of Arkansas and Tulane University. Arkansas is an extremely physical team and is capable of driving the ball against any opponent. Unlike many other teams, the Razorbacks do not run their offense through a single elite driver, but instead have equally capable chasers all across the field. To counter this multi-faceted threat, Clone Star chose to run its defense primarily with its beaters. Bilanoski and Sliva were able to maintain bludger control for a huge majority of the game, which allowed the Clone Star chasers to stay within range of Arkansas and, eventually, for the Clone Star seeker to have a much easier snitch pull. Tulane, on the other hand, runs its offense through the raw physicality of chaser Todd Mathieu. A ferocious driver, Mathieu was capable of driving through even the best of the Southwest’s point defenders. His drives were supported by the beating duo of Joshua Mansfield and Sam Weisser, who held bludger control in favor of Tulane for the majority of the match. During this game, Clone Star decided to religiously double-team Mathieu. On defense, Sliva was sent up to buffer out the Tulane beaters, allowing Bilanoski to take care of any pass option Mathieu might have had. The result was that Tulane only scored three goals during the entirety of the seeker floor. These two situations demonstrate the two extremes–one in which Clone Star’s chasers were overmatched, and one in which its beaters were overmatched. 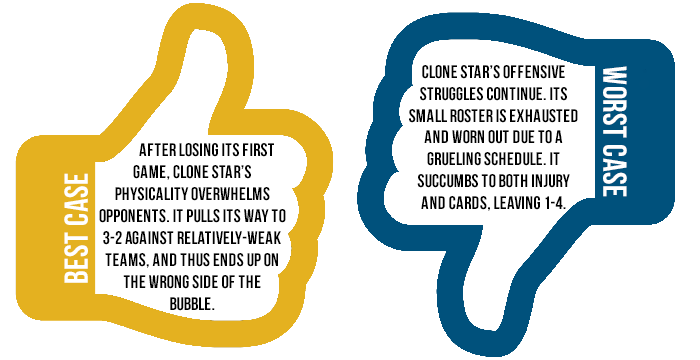 Clone Star’s ability to emerge victorious in both cases is a testament to its strength as a team. Graphics and photo illustration by Amanda Dallas. Original photos by Michael E. Mason (left) and Nicole Harrig (right).